Back in the day, every time we finished an architectural rendering we’d make a postcard and send it out, announcing to the world how awesome we are. As time progressed, things got busy and it was harder and harder to find the time to get the postcards out. We decided that with the onset of our 11th year, it was time to get things rolling again. Credits go to TVSdesign in Atlanta, Brown Chambless Architects in Montgomery, HGBD in Savannah, and Bargmann, Hendrie+Archetype in Boston. This time around, we decided to showcase some of our past architectural renderings alongside the completed project. 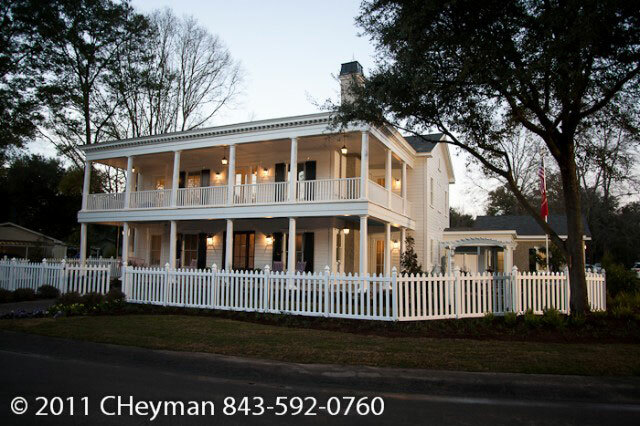 First up, one of our more recent projects, the Extreme Makeover Home Edition Beaufort County project house. 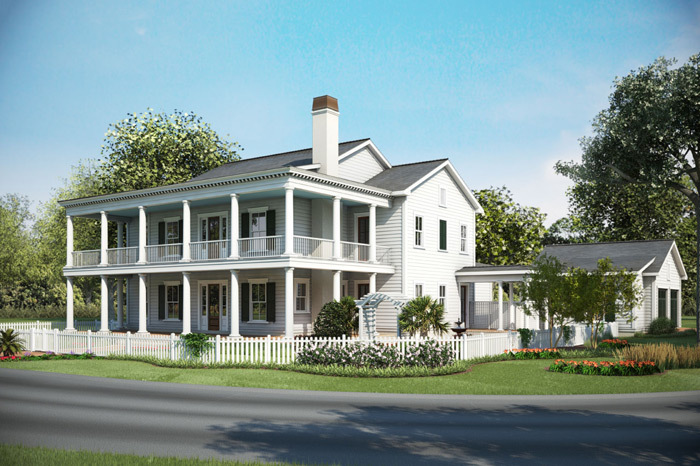 We worked with Court Atkins Architects out of Bluffton, SC to create a rendering that showcased the project house for the media and other VIP guests. This episode has not aired yet, so stay tuned! Second is the AIDT Maritime Training Center in Mobile, Alabama, designed by Goodwyn Mills Cawood Architects out of Montgomery, AL. We created this architectural rendering to help with the design process as well as show off the proposed building to the client. 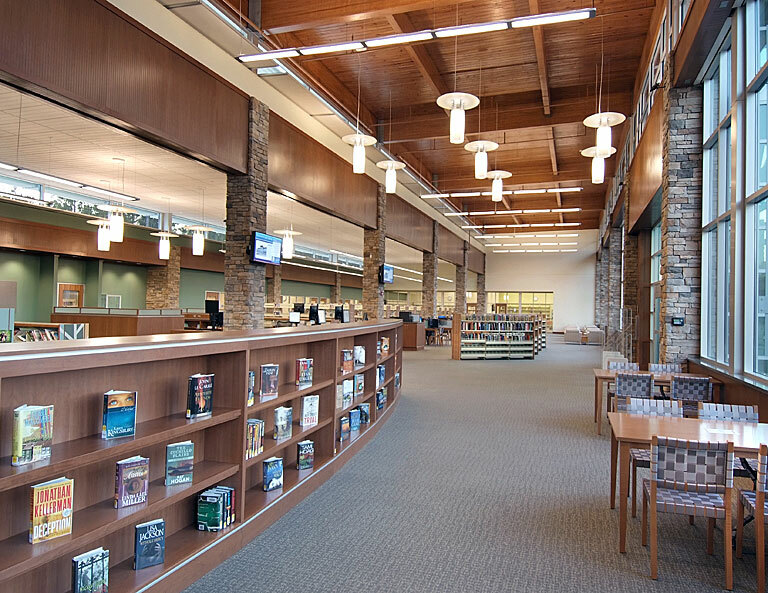 The Last project is the interior of the Porter Memorial Branch Library in Covington, Georgia. 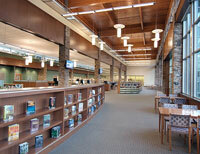 The library was designed by Craig Gaulden Davis Architects out of Greenville, SC. 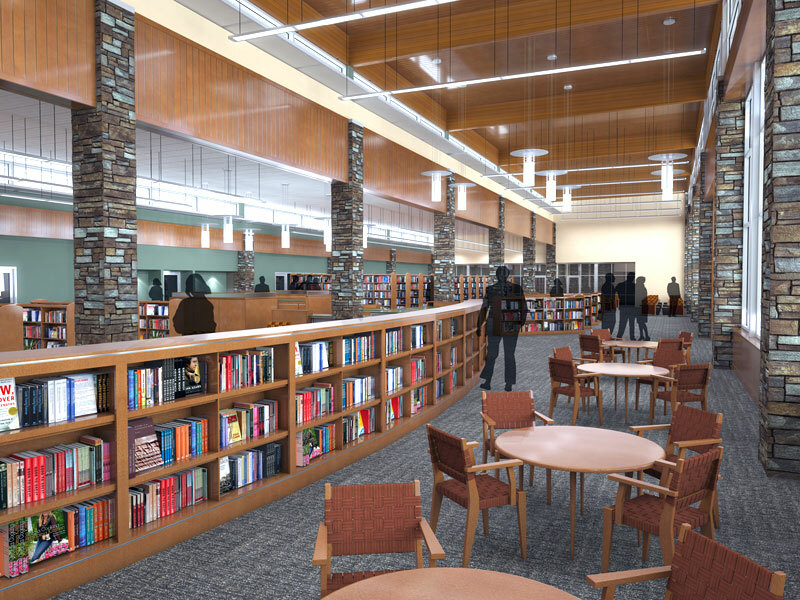 We did both exterior and interior renderings of the library for presentation to the County Library System. My favorite part of the article is the that they quote SCAD’s (Savannah College of Art and Design) very own Tim Woods, a former professor of mine, who, while I was in School was so Anti-Computer that we had to spend hours devising ways to make our plots look hand drawn. It involved an ancient pen plotter, any paper other than bond, and a program called “Squiggle” that could take a CAD plot and make it look hand drawn using a variety of preset styles. Batzal Software’s roof designer is a plugin for 3D Studio Max that allows a user to create three dimensional tile roofs with relative ease. There are two ways to start with the program: The first way is to create a flat editable poly that contains the different faces of the roof, and allow the program to specify the heights and slopes of the roof (the included tutorial walks you through this process) and the second, which is the method I use, is to import already modeled geometry to use as a base for the plugin to work from. The only catch to using imported geometry is that it has to be single faces for each roof surface, and it may need to be converted to an editable poly or mesh. Once the base geometry is there, the plugin is simple enough to use. Essentially, the plugin will automatically create tiles for the roof surfaces based on preset or custom styles, and if you want to add edge tiles, you go into the plugin, choose which edges you want tiles created on, and have the plugin in regenerate the tiles, with the included edges. Two things that confused me a little were that the first time you apply the Roof Designer modifier to the editable poly, the entire thing becomes flattened. Don’t be alarmed though, all that has to be done is click on the “get shape from stack” button, and the roof will go back to normal. This is the plugin’s way of reading the geometry so it can figure out what goes where. The other thing that was a little strange was that if the “put shingles” radio button is checked, the geometry disappears until you click on the “Build Covers and Shingles” button, to actually generate the shingles. The plugin has a lot of preset shingle styles to choose from, and the width, depth, and height can all be adjusted to suit. You can also set the curve segments of each tile to increase or decrease the amount of geometry in each tile. The other nice feature is that the plugin allows random material ID placement on the tiles, so it’s easy to create a mix of colors in the roof. My two main complaints with the program are these: Once the roof is created, it creates a huge amount of geometry, which obviously slows the program down. I can’t really fault the plugin for that, but once the roof was created to my satisfaction, I collapsed the object to an editable mesh, and chose the display as box option on the object to speed up the program. The second complaint is the way the plugin deals with slicing the tiles at the edge of the roof planes. By default, the plugin slices the tiles “plumb” and not “square” to the roof plane at the base of the roof, which is never how these types of tiles work. There are workarounds to the problem: you can offset the base tile until it doesn’t need to be cut anymore, or adjust the size of the tile so it mathematically works, although I wasn’t able to get it to work as perfectly as I would have liked. All in all, this is a great plugin for these types of roofs, and the $55.00 price tag makes it a very reasonable purchase. My only minor complaint is how the roof edge is dealt with at the base of the roof. With the purchase of the program, Batzal has also included the Siding Designer, which works the same way, but allows the placement of tiles on vertical surfaces – a useful feature for cedar (or concrete) shake walls. Our rendering for Goodwyn Mills & Cawood’s Motus Motorcycle project was chosen as the image for CGArchitect’s Vizualisation Pro of the Week. CGarchitect is the leading online 3D magazine for architectural CG artists and architects who specialize in 3D computer graphics and illustration for architecture. This review was originally written for CgArchitect.com. With the latest version of 3ds Max Design, Autodesk has delivered one of the most feature-rich updates to their product in several releases. Interface refinements, new data import/reference components, material editor improvements, and additional feature sets make this release of 3ds Max Design a product worth looking at. 3ds Max Design 2011 continues with the 2010 product line’s use of the “Ribbon” palette, with some improvements. The Ribbon can be switched between horizontal and vertical with the right mouse button, and the user can add, delete, and modify all of the panels, tabs, and buttons with customizable controls or tools based on the user’s likes, using the “customize ribbon” dialog. In my opinion, one of the most important addition to this version of Max Design is the ability to file link a Revit generated FBX file, complete with presets based on linking by material, family, or category. This is a huge step for the inter-operability between what is more and more becoming the standard program for Architects (Revit) and the standard program for Architectural Visualization (3ds Max.) For a very long time, we’ve been able to file-link dwg files straight from AutoCAD, so when the dwg file is updated, hit a button or two, and the updated file appears in Max, without losing material applications, UVW Maps, or any other modifiers that had been applied. With the new FBX file-link option, Revit models have pretty much the same luxury, other than the additional step of exporting the FBX file from Revit first. This is a huge improvement over the previous method of exporting from Revit, importing the FBX, dealing with the triangular edges, grouping by material, cleaning out all of the unused parents, etc. My one complaint with the FBX linking is how long it can take to link large files. Even with a fairly speedy workstation, I can expect to wait 5-10 minutes for some big FBX files to link. The other major import feature added to 2011 is a Google SketchUp importer. It’s a very nice way to import files directly into Max from SketchUp without having to first export into another file type. The usefulness of this importer greatly relies on how the Sketchup file was built to begin with, but I’ve used it multiple times already with great success. This importer was also available as an extension pack to 2010, but according to Autodesk, some features have been improved and optimized for this new release. One improvement that Max users have been asking for since 3ds Max v2 was released that is finally incorporated into 2011 is the Save As Previous option. Now you can (with some limitations of course) save a file as a 2010 version for some slight backwards compatibility, in case you need to work with the older version of the software. One of the most anticipated additions to Max Design 2011 is the all new “slate” material editor. Slate is a node based editor, giving the user the ability to visualize in a very clear manner the way a material is laid out, rather than having to click on map after map over and over again to find your way through a complex material. With Slate, the material is laid out in a flowchart fashion so you can visually see what map goes to what map type all at the same time, making it much easier to find and edit individual maps within the material. The other good thing about the Slate Editor is that in case you don’t like it, or just want a more compact look at what’s going on with the materials in your scene, you can always choose to use the standard material editor as an alternative. A new object painter that incorporates features of some of the 3rd party scripts available, allowing you to “paint” selected objects onto a 3rd object interactively, while randomly changing scale, rotation, and local translation. The one thing that I don’t like about the built in object painter is that its “fill” option doesn’t really fill the 3rd object with the other selected objects (similar to scatter,) but only fills along a selected edge loop, similar to the way the spacing tool operates. New “caddy” spinner. This one I like. Instead of the old method of interactively changing editable poly options (for example, chamfer distance, how many segments, etc) which gave you a dialog box on the screen, the “caddy” is just a few buttons and checkboxes superimposed over the viewport next to the selected editable poly sub-objects. It’s a cleaner way to see what you are changing and how it affects the selected sub objects. A new snap icon for moving objects with snaps turned on. With the new version of Max, they have added a small snap handle at the center of the move axis (indicated with a circle) to allow more precision while moving objects with snaps. Instead of randomly trying to grab axes and to move the object at its pivot, you can grab the circle snap indicator and know for certain you’re grabbing the right spot. The new Quicksilver hardware renderer. According to the documentation, there’s a minimum hardware requirement for this to work (which you can verify under the help menu.) Even though my machine was more than capable of handling the hardware renderer, when I tried to use the renderer with a simple scene of 3 boxes and a concrete map, I got the first BSOD I’ve had for as long as I can remember. Viewport Canvas. This has the makings of a very useful tool, as it gives the user the ability to directly paint on a 3d object in a scene, modifying the material and maps in the scene interactively, with some of the same layering and tool options that Photoshop offers. Again, my main issue with this tool was one of performance. I tried a very simple scene with a single box, a single brick texture applied to the box, and my computer still struggled with painting on the box. I think if Autodesk is able to optimize this tool, it will become very useful. Improved EXR support. With EXR files being used more and more for their compositing usage and high color range, Max design 2011 updated its EXR plugin the ability to include unlimited layers, g-buffer data, rendered elements, all while better optimizing the plugin for better performance. Inclusion of Autodesk’s Composite program, an add-on tool for doing compositing, color correction, and post processing work. I haven’t used the program very extensively to give it a review, but the fact that it is included with Max design is a pretty good feature in and of itself. In the latest version of 3ds Max Design, I think Autodesk has delivered a version of the software that’s actually worthy of a revision number. A lot of times there’s very little difference between one version of the software and the next, with only minor updates and what really only amounts to service packs, in what seems to me a way to make sure that people who are on the subscription program stay happy. With this release, Autodesk has made enough changes and updates to the software to make it worthwhile as a true upgrade. Save as Previous. As I mentioned before, this is one improvement that users have asked about for a very long time. Object Painter. While not as robust as some of the other object painting scripts that are available, it’s still quite useful. Quicksilver renderer crashed computer (not just program), even though according to the specs, my computer is more than capable of using the renderer. Viewport Canvas was pretty slow to use also, although according to what I’ve read on the forums, if you unwrap the UVW first (a crucial step that is skipped in the documentation) it performs much better. Object painter. In order for it to be fully useful, Autodesk needs to give this one some more features. 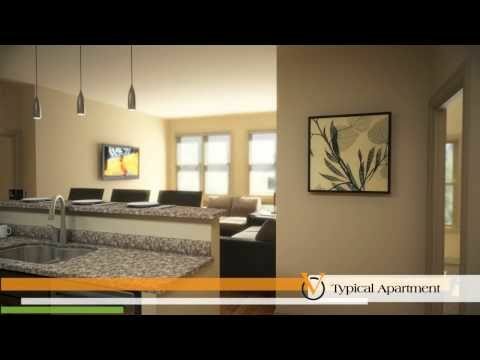 We just completed the animation for the project we were working on in College Park, Maryland. It’s for a private student housing center, and we animated the exterior, the lobby, the 2 story fitness center, the game room, the business center and a typical apartment. The final animation ended up being just over 8 minutes long, and was 15,600 frames rendered at 720p resolution (1280 x 720 pixels.) With all of the different rendering passes, the frames alone added up to 40 GB’s of data. In honor of our 10 year anniversary, we scoured through the archives and (reluctantly) found our very first official BlueLime Studio™ architectural rendering. 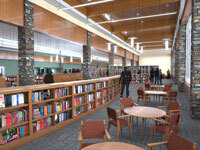 While we had been doing renderings separately for a few years, this is the first project we had as BlueLime. The project was part of a capital campaign fund raising effort by Grace Church of the Islands here in Savannah. Working with Poticny, Deering, Felder Architects (now Greenline Architecture) we created a marketing video complete with an animated location map, highlighted floor plans, videotaped testimonials, and an animation of the exterior and interior spaces of the proposed multi-purpose/sanctuary building, all output to VHS tape. Below are some still images of the interior spaces. These were rendered on our state of the art Single Pentium 933′s with a whopping 512 MB of RAM per workstation. Our client, The Varsity at College Park, in College Park, Maryland posted these architectural renderings on their Facebook page. We’ve been working on renderings and animation for their private student housing , to be used for students at the University of Maryland. The building includes a 2 level fitness center, a business center, a game room, a massive lobby, an exterior courtyard, and retail shops on the main floor. We’ll also be completing an animation and 360° panoramas for each space.